1 What Is A Rotator Cuff Tear? 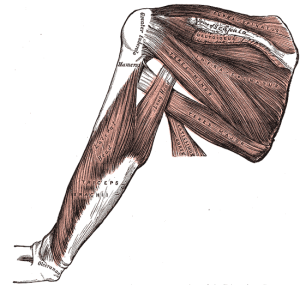 The shoulder is a complex joint in the body that is made up of a number of bones, tendons, and muscles. The main bones of the shoulder joint are the humerus, clavicle, and scapula. The infraspinatus, supraspinatus, teres major, and subscapularis are the muscles of the rotator cuff that provide support for the shoulder joint. Shoulder pain is commonly caused by injuries to the tendons or muscles of the rotator cuff. Rotator cuff tears tend to occur in a patient’s dominant arm. Pain, tenderness, weakness of the shoulder, and decreased shoulder range of motion are common symptoms of rotator cuff injuries. The pain associated with rotator cuff injury ranges from mild to severe, and may come on gradually or suddenly. The pain may also radiate through the affected upper extremity. Activities that involve reaching overhead or behind the back are commonly associated with increased pain. Lifting and pulling activities, as well as lying on the affected shoulder may also result in increased pain. Popping, cracking, or clicking of the shoulder may occur with shoulder movement. 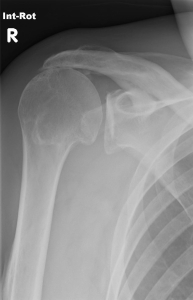 Examination of a patient suspected of having a rotator cuff tear will include a detailed history and physical examination. The history will include questions related to the onset of pain and specific questions to address current symptoms. The physical exam will include palpation of the affected area, muscle testing, sensation and reflex testing, and various orthopedic tests. Additional tests, such as ultrasound or magnetic resonance imaging (MRI), may be ordered to confirm a tear and determine the severity of the tear. Research has suggested that rotator cuff tears generally happen over time, despite many individuals reporting a sudden onset of their symptoms. Overuse injuries are the most common cause of rotator cuff problems. Anyone can suffer a rotator cuff injury; however, athletes that participate in overhead activities such as tennis, volleyball, racquetball, and baseball are at an increased risk of injury. Patients who have chronic rotator cuff strain are at an increased risk for serious complications. Re-occurring degeneration and disorganization of the tendons of the rotator cuff can lead to small tears that do not properly heal. This results in a weakened tendon that is more susceptible to serious injuries. Although overuse is the most common cause of rotator cuff injuries, other factors are associated with an increased risk of injury, including being male, being older, and having a history of shoulder injury or trauma. The shoulder is subject to other injuries besides rotator cuff tears, including tendinitis and bursitis. Thickening of the tendon, resulting in tendon stiffness occurs as the result of overload on the tendon. If overload on the tendon continues, the tendon will weaken, leading to degeneration of the tendon. The result of this degeneration is tendinitis. Another common issue with the shoulder is bursitis. Bursitis is characterized by inflammation and irritation of the fluid filled sacs (bursa) around the shoulder joint. Conservative treatment options are generally recommended for patients suffering with mild to moderate rotator cuff pain. These conservative measures include rest, stretching, and strengthening exercises, as well as over-the-counter pain and anti-inflammatory medications. Oral steroids may also be recommended to reduce pain and inflammation of the affected joint. Steroid injections may be considered for patients who suffer with chronic rotator cuff pain. However, this procedure has been associated with an increased risk of future tendon rupture, so patients are encouraged to discuss this treatment thoroughly with their physician. For cases that do not respond to conservative treatment options, surgery may be considered. It is important that patients allow the joint to heal completely before returning to normal physical activity, even if pain and inflammation are no longer an issue. Full recovery may take weeks to months to occur. Pain, stiffness, and swelling of the shoulder are symptoms of rotator cuff injuries. While many patients report that their symptoms had an acute onset, research has shown that the symptoms are likely the result of degeneration and weakening of the rotator tendons over time. Individuals who engage in overhead sports such as tennis, racquetball, and baseball are at an increased risk of suffering a rotator cuff injury. There are various treatment options available for individuals suffering from rotator cuff injuries, ranging from conservative methods including rest and exercise to more aggressive options including steroid injections and surgery. A treatment plan consisting of multiple treatment methods may provide the most benefit for patients suffering from a rotator cuff injury. Patients are encouraged to speak with their physicians to come up with a suitable treatment plan for their condition. Bishay V, Gallo RA. The evaluation and treatment of rotator cuff pathology. Prim Care. 2013;40(4):889-910. Gialanella B, Bertolinelli M. Corticosteroids injection in rotator cuff tears in elderly patient: pain outcome prediction. Geriatr Gerontol Int. 2013;13(4):993-1001. Grimshaw CS, Cannada LK, Cutuk A, Kaar SG. Missed rotator cuff tears in polytraumatized patients. Am J Orthop. 2013;42(10):466-9. Longo UG, Rizzello G, Berton A, Maltese L, Fumo C, Khan WS, Denaro V. Biological strategies to enhance rotator cuff healing. Curr Stem Cell Res Ther. 2013;8(6):464-70. Mather RC III, Koenig L, Acevedo D, Dall TM, Gallo P, Romeo A, Tongue J, Williams G Jr. The societal and economic value of rotator cuff repair. J Bone Joint Surg Am. 2013;95(22):1993-2000. Schnaser E, Toussaint B, Gillespie R, Lefebvre Y, Gobezie R. Arthroscopic treatment of anterosuperior rotator cuff tears. Orthopedics. 2013;36(11):e1394-400. Yamamoto A, Takagishi K, Osawa T, Yanagawa T, Nakajima D, Shitara H, Kobayashi T. Prevalence and risk factors of a rotator cuff tear in the general population. J Shoulder Elbow Surg. 2010;19(1):116-20.